I really like how this turned out. Took this picture while we were in Vegas and it wound up being one of my favorites. Don’t ask me why – I just think it looks cool. This was taken from the top of the Eiffel Tower at the Paris. 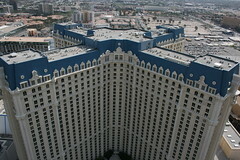 This entry was posted in Flickr Picks, Photography and tagged flickr, hotel, las-vegas, paris, Photos by Ron Bieber. Bookmark the permalink.